Operation TORAL 6 represents a rewarding opportunity for a platoon commander, and we are probably among the last who are lucky to have Helmand veterans as non-commissioned officers in our platoons and to benefit from their experience. However, it is easy to make the mistake of too many comparisons. 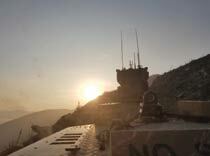 Where once we might have been in a remote Patrol Base, in Kabul we had the comforts of New Kabul Compound (NKC). However, my time as an Advisor Force Protection commander was a rich and varied experience with plenty of challenges against a real threat in a complex environment. There is no doubt that NKC is comfortable. My fellow multiple commanders and I used to say, I hope it can be recognised as ironically, that the reason we had ice cream with every meal was that we never knew which patrol would be our last. In the same vein, as the junior platoon commander in the Company, I went on the popcorn runs in the evening and had to vary my routes to and from the cinema room to avoid pattern-setting, lest I earn the ridicule of those I commanded. However, while Kabul 2018 is a world away from Helmand 2009, the comforts of NKC acted as a thin façade over the reality in the city. Every night our O Groups were relentlessly filled with the carnage that was going on outside the walls. It might be a suicide bomber in a packed wedding hall, or a magnetic IED slapped onto the side of a police vehicle. During the elections one could hear the rumble of explosions on the way to lunch. These briefings served to remind us that though easy to forget, the threat in the city was very real, and that a lazy multiple commander would be punished for his complacency. Not only this, but the facilities of the camp did not protect against a hectic pace of operations. 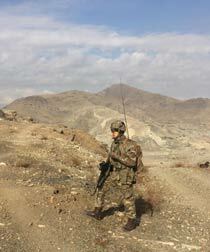 During the height of our patrolling, it was normal to be out on three patrols a day with around 12 hours on the ground. When this was mixed with night missions, handovers, briefs and the extraordinary amount of computer-based administration that came with each patrol, leisurely lunches were not an option. It was churning out these patrols and the preparation for them that the training at the Infantry Battle School in Brecon came mostly into play. We became used to keeping up with a relentless battle rhythm, albeit in a dark mood at the bottom of a sodden shell scrape. Advisor Force Protection was the focus of our mission and where we could most tangibly see the positive effect. This is now commonly referred to the ‘Armoured Uber’ role, protecting the mentors assigned to build up the capacity of the Afghan National Security Forces and Government. The threat in this instance is Green-on-Blue that lurked in the shadows in any dealings with the Afghans. Towards the end of our tour a spate of attacks, including an insider attack on the commander of Operation RESOLUTE SUPPORT and an attack in Kabul itself, meant that this became the greatest concern. Delicately ensuring that we wouldn’t be shot by an impressionable young Pashtun new-draft had to be weighed against not alienating the Afghans further, causing greater risk. Alongside these we had missions to put off the insurgents from firing rockets into the Green Zone (not uncommon) and patrolling the city to put the Taliban off their balance in a ‘mad ballet’ of deterrence patrols, all the while navigating the bewildering Kabul traffic. We also conducted a number of deliberate operations, when the Company might go out to deter en masse in an area or provide security for an event. This meant planning, coordination and the patrols fighting hard for communications in the mountains surrounding the Kabul basin. These operations offered us the best chance to go to unfamiliar parts of the city, undertaking dynamic tasks, requiring imaginative planning. I once spent all night assessing how I could guide in an underslung load on to a remote mountain outpost only to find out on the day that some smoke and a marker panel are all that are required. TORAL is probably the most interesting and dynamic operation on offer to an infantry platoon commander in the British Army today, and it’s an experience I deeply value. It was a privilege to lead my Guardsmen and to see them develop, and to have gone through it all with them was where the real joy of it lay. My colleagues and I never forgot that. In terms of the threat, variety and challenge, we were amongst the luckiest of our generation.